Pretty amazing options for the often neglected samurai class!! This installment of the Porphyran class-option series clocks in at 30 pages, 1 page front cover, 1 page editorial, 1 page SRD, leaving us with 27 pages of content, though it should be noted that the content is formatted for A5 (6” by 9”). So what do we get? The samurai has always been a class defined by culture as much as by mechanics and as such, it is only suitable that this pdf begins with a contextualization of the samurai class within the framework of Porphyra….but after this brief piece of fluff, we begin with the first archetype almost immediately. This one would be the Blade of Two Minds, torn between the ideals of two orders…which also tells you from the get-go what the shtick of this archetype is: You choose two orders. You gain both class skills, but only receive the skill bonus of one; challenge bonuses may be switched via a swift action. The archetype must also select one order ability at 2nd, 8th and 15th level – though she may take one from a lower level. Beyond the obvious issue of juggling the strict requirements of two edicts (seriously, try playing that cool imba combo you came up with sans screwing up…), the archetype also loses weapon expertise. Solid, no balance-complaints here. The second archetype would be the daimyo, who gains a banner at first level that grants its bonus to all attacks, but pays for this ability with the powerful resolve. 5th level does net resolve…but at -4 levels. 4th level nets something unique as well: If an ally within banner reach takes a penalty to atk due to using a feat (as Power Attack et al. ), he decreases the penalty by 1 and by a further 1 at 10th and 16th level. This replaces mounted archery. At 8th level, allies receive +1 to damage on all attacks, increasing that by 1 at 10th level and every 5 levels thereafter. Honorable Stand’s benefits are extended to all allies in reach of the banner and 17th level allows for the expenditure of two resolve to save an ally in range of the banner, instead letting him survive at -1 hit points. These banner tricks, though, eliminate the whole resolve-improving progression. Basically a samurai with a powerful buff-aura…fits thematically. Kajiya are master blacksmiths and add their class level to Craft (weapons) and Craft (armor), forged himself, treated as though he had Master Craftsman and gains Craft Magic Weapons and Armor at 4th level. His weapon expertise extends to all weapons he has crafted himself (nice!) and 5th level provides weapon training with weapons he forged, with each additional 5 levels either increasing it or providing an advanced weapons training. He does pay for this with the mounted tricks as well as banner, though. The Kamen Blade receives basically the vigilante’s dual identity, with his identities being designated as either “social” or “masked.” Kamen Blade transformation is facilitated by a special, magical mask and takes but 5 rounds…but is accompanied by loud noises, lights…if you have ever seen a kamen rider, power rangers, sailor moon, etc. episode, you’ll get the drift. 7th level nets the quick change talent, 11th the immediate change talent…but these do eliminate the samurai’s order. 6th level and every 6 levels thereafter, the archetype receives an avenger vigilante talent instead of bonus feats, though combat skill is prohibited. 8th level has a glitch – it notes that you may use bladed dash 1/day as a SP…got ya. However, +1/day at level 5 and every 5 levels thereafter makes no sense in that context…I think something went awry in ccp here…also since it replaces the order ability “gained at ‘8nd’ [sic!] level.” 15th level upgrades this to greater bladed dash. The Kyudojin’s challenge affects ranged, rather than melee attacks and is treated as having point Blank Shot for the purpose of feat prerequisites. He also gains Precise Shot at 1st level and may ignore the cover granted to a target by an ally for one round, usable 1/day, +1/day for every two class levels thereafter. The ability fails to mention an activation action, but I assume free…still, can it be used in conjunction with AoOs? Do you have to decide to ignore cover prior to shooting or can you decide retroactively? A bit of clarification would be in order here. This sniping prowess replaces, just fyi, resolve, but is counted as such for the purposes of feat prereqs etc. 4th level eliminates the penalty to atk when a mount’s moving and reduces that of running mounts to -2. 9th level provides a trick shot bonus feat, even if he does not meet the prerequisites, chosen from Ace Disarm, Ace Trip or Ricochet Shot. The aforementioned careful shot ability that replaces resolve is used as a substitute grit for these, in case you were wondering. During a honorable stand, he may use careful shot to fire sans provoking AoOs. As a damn amazing level 17th ability, he can fire an arrow as basically a line – for each careful shot spent, he may hit another foe in line with the respective piece of ammunition. The Lotus Exile begins play sans order and may never become a member of the order of the lotus…but he may attain membership in another order. He gains a more intelligent mount and Horse Master as a bonus feat at 1st level as well as Mounted Combat. Speaking of which: At 9th level, he may use Mounted Combat up to Dexterity modifier times per round (minimum 2). Additionally, at 4th and every 3 levels thereafter, he does receive another bonus feat building on Mounted Combat as a prereq, additionally adding half his level to Ride’s ranks for the purpose of qualification, unlocking mounted feats earlier than usual. 5th level and every 5 levels after that net the archetype a teamwork feat that is automatically shared with the mount. 14th level is brutal: At the cost of losing one attack, the lotus exile may still make a full attack when his mount moves or charges, though all attacks are executed at -2 to atk. 17th level nets +2 Str, Dex and Con for the mount. It should come as no surprise that this archetype pays for the mounted mastery with pretty much the whole resolve and banner sequences of abilities. One note: In absence of an order, I assume challenge to be locked at the start of the game for the archetype – some explicit confirmation/information pertaining this would have been appreciated. The Seishin replaces challenge at first level with an oracle revelation from the Ancestor mystery, with additional revelations being unlocked every 3 levels thereafter. The revelations are governed by Cha, just fyi. The ability comes with full oracle-multiclassing synergy notes…which is neat. As befitting of the theme, the seishin replaces the order abilities gained at 2md, 8th and 15th level with the oracle’s haunted curse. Brief, but flavorful. The yamabushi must be lawful and loses armor and shield proficiency, but gains a monk’s Wisdom-based, scaling AC-bonus. Similarly, mount is replaced with the monk’s fast movement. 3rd level provides access to a ki pool equal to 1/2 class level + Wis-mod and ki may be expended as a swift action to grant the archetype +1 attack at the highest attack bonus when used in conjunction with a full attack, stacking with haste (not properly italicized) etc. The access to ki eliminates weapon expertise, though it does have more uses, for at 4th level and every 3 levels thereafter, the yamabushi may select a ki power from the unchained monk’s arsenal, applying them to weapons the yamabushi is proficient with instead of unarmed or natural attacks. Te archetype does pay for this with mount and weapon expertise…making this a fragile, if interesting glass cannon-y take on the samurai. I mentioned the order of the lotus before, so what does it do? Well, members of the order may inflict only +1/4 class level (min 1) bonus damage on challenges, but their allies also gain this bonus! Now I’d like to know whether multiple samurai can grant the benefits of this ability to their allies. Usually, the reply’d be obviously no, but due to the unytped nature of the bonus damage, I am not entirely sure.Skill-wise, they add Knowledge (local) and Knowledge (nature) and receive 1/2 class level to social skills, depending on the attitude of the person interacted with: Diplomacy for friendly and helpful, Bluff and Intimidate for the other attitudes. 2nd level allows for the sharing of teamwork feats with allies for 30 minutes per class level and yes, the ability does feature synergy with tactician et al. 8th level is wonky: When a samurai and an ally hit the same target in a given round, they deal additional damage…but since rounds happen in sequence, is the first character’s damage increased retroactively? Or is only the second hit increased thus? That one could be a bit clearer in its wording. 15th level allows the samurai to take the damage of an ally as an immediate action if that damage would bring the ally below 0 hp. Members of the order of the pack MUST have a mount and when flanking a challenge target, both he and his mount gain Outflank. If they already have it, they instead gain a +5 bonus. Skill-wise, they gain Knowledge (nature) and Knowledge (geography) and add 1/2 class level to Handle Animal checks pertaining their mount. Instead of a 2nd level ability, they begin play at 1st level with a wolf or dog as the mount. 8th level grants a teamwork feat to the mount. 15th level lets them emit a howl as a full round action 1/day, granting allies within 30 feet all teamwork feats and haste (not properly italicized) for 1 minute. The ability’s ex and should be Su. Additionally, how does it work? No, seriously. Animal companions have their own initiative, so how do they spend the action with the samurai? This becomes very important to determine when the ability goes off and looks like the pretty common houserule of collated initiatives creeping into mechanics. I like the idea, but it doesn’t work as written. Members of the order of the peacock may switch challenge targets as a swift action, but at the cost of losing the damage bonus upon switching. Skill-wise, they gain Knowledge (local) and Knowledge (nobility) and add the usual skill bonus to Intimidate uses in conjunction with the Antagonize feat, which is gained as a 2nd level bonus feat and may be used up to class level times per day versus challenge targets…which is a bit weirdly worded, as it implies that Antagonize can only be used so often, when in fact, the limit pertains a single given creature. Considering how often the feat can be used against a single target, getting rid of the limit for you would have been the more elegant idea here. 8th level lets the samurai expend resolve as an immediate action to gain temporary hit points equal to twice his class level, but only for one round – neat idea! 15th level allows the samurai to Antagonize targets of his challenge as an immediate action when they attempt to harm others. The order of the shadow doubles his challenge damage bonus on the first attack if the target is unaware of him. Skill-wise, he gets Knowledge (local) and Stealth and subtracts 1/2 class level from his armor check penalty for Stealth purposes. NICE! 2nd level nets either darkvision or increase of darkvision range and 8th level hide in plain sight. 15th level allows for full attacks or movement + attack in a surprise round, provided a challenge is made against the target of the attack. Okay one. The pdf goes on to present a new mount the qi dragon, which is based on a new CR 3 critter that is actually an animal, so balance type-wise is maintained. However, it sports 1d2 bleed on bites…that stacks with itself. Now I am a big fan of stacking bleed….but RAW, it shouldn’t do that. The qi dragon also receives +2 to saves versus spells. Mount stat-wise, the qi dragon’s balanced, though, considering the acidic breath weapon which may not do much damage, but can be used indefinitely with only a cooldown, I would have moved advancement not to 4th, but 7th level. Still, this guy should not break any games….and it is kinda cool. Now I mentioned Horse Lord – that feat would let you use character level instead of class level to determine your effective druid level for animal companion purposes. Katana Mastery increases your effective weapon size when drawing a katana, which you draw as part of an attack action. Improved Katana Mastery extends the benefits of the former to a full attack…and adds Vital Strike’s benefits to the first of the attacks…which imho is pretty overkill in conjunction with the sword saint archetype or similar iaijutsu masters – the feats do offer synergy here. Vital Strike does not need to be part of a Katana Mastery full attack. Improved Mounted Archery negates any penalties to atk for using a ranged weapon while mounted. Inspiring Resolve is neat: When you use resolve to end a condition, you may extend the benefit to all allies within 30 ft. – powerful and very unique and samurai-y in feeling. Interior Resolve lets you expend 3 resolve to become immune to precision damage for one attack, but you must do so after the attack has hit, but before effects are made known. Peacock Fan is basically a variant of Dazzling Display, antagonizing every foe within 30 ft. as a full-round action. Resolute Body nets you twice class level temporary hit points via the expenditure of 2 resolve, with the points lasting for one hour…however, you may only use this 1/day. I think I may have added a scaling daily-use on level increments of 5 here. Resolute Strike can be activated only when you have at least 2 resolve and lets you expend all of your remaining resolve as a free action upon causing damage – if you do, you inflict maximum damage, but also end your turn. The pdf also covers new magic item abilities: Iaijutsu adds precision damage on a round a blade is drawn; resolute lets you reroll misses due to natural 1s via resolve (but fails to specify whether this is an action – I assume it’s part of the attack.) and thirdly, retracting weapons may, as a move action, shift between reach and non-reach…which is pretty damn cool. Resolute armor nets the resolve class feature 1/day or +1 daily use. A fire-light-themed katana named Amaterasu, a shocking naginata named Susano’o, a faerie fire inflicting animal bone longbow named Tsukoyomi – those even halfway cognizant of Japanese mythology will enjoy the respective twists of the tropes and adaptations to the Porphyran context, even if the names imply power far beyond what the items offer. Armor-wise, Sosen, the armor of the ancestors, allows for access of the spirit of the warrior revelation in addition to its protective properties. Nice: The duration of said power may be extended by the expenditure of resolve. The Banner of the Unyielding Legion may be driven into the ground by a cavalier or samurai, acting as their banner…but samurai may also use it to grant allies within the banner’s range access to their resolve. Shogun Kabuto is pretty much a must-have item for quite a few builds – beyond a bonus to Diplomacy and Intimidate, it also decreases the activation action of Dazzling Display and Peacock fan from a full-round action to a standard action. 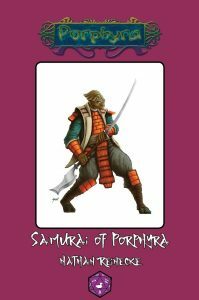 The pdf concludes with several nice favored class options for porphyran races and a CR 10 sample character, Ec’sa Thisasaa, a saurian daimyo, complete with background story. Editing and formatting are good on a formal and rules-level – while some abilities can use a bit of clarification, as a whole, the pdf is precise – the orders sport some minor hiccups, but with one exception, nothing too grievous. On a formal level, there are a couple of wordings and italicizations and similar minor hiccups. Layout adheres to Purple Duck games’ 1-column standard, is pretty printer-friendly and employs an appropriately Asian-font, which is a nice touch. The pdf sports 2 nice pieces of full-color artwork. The pdf comes fully bookmarked for your convenience. This is the first book by Nathan Reinecke as a lead designer I have tackled (though Perry Fehr, N. Jolly and Shinigami02, the contributing authors have, for the most part, had the dubious pleasure) – and frankly, I am more impressed than I expected to be. The designs herein are not earth-shattering or wild, sure – but they do their job damn well. The archetypes universally find a very sweet balance in their new features and what they lose; the respective specialists actually excel at their fields of expertise sans becoming complete one-trick ponies…and they are flavorful. While the orders contain a couple more hiccups than I like to see, the feats have some seriously neat ideas and the magic items or mount left me sans complaints. Here’s the thing that made me really like this: It makes the samurai feel more like a samurai. It has a couple of rough edges, yes. But it adds some staying power to the guys, emphasizes commands, social banter, iaijutsu, etc. – particularly the temporary hit points buffer-shield options feel very appropriate for the class with its emphasis on honorable combat, standing one’s ground, etc. While I really disliked the order of the pack and the order of the shadow, both peacock and lotus have some serious potential and did not bore me…which is saying something after the number of orders I’ve read. Traditionally, first time authors get a bit of leeway from yours truly and hence, I will round up from my final verdict of 4.5 stars for the purpose of this platform, in spite of the glitches. If you want to play a samurai, this very much is a book you should get. You can get these cool samurai-options here on OBS!